There are many ways to store handguns in gun safe. 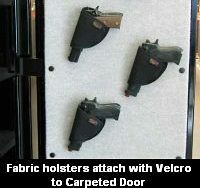 including hanging your handguns on the inside door panel with Velcro straps or Velcro-equipped sleeves. Some folks try wood pegs for the triggerguards. The problem with these methods is that it’s just too easy for Velcro to work loose, or a peg to come out. End result is a dropped pistol. Also, placing your handguns on a door makes them highly visible. That’s a bad idea if your safe is placed in an open area such as a garage or game room. Versatile offers two models, for either 4 guns or 6 guns. These can be purchased directly from Versatile, starting at $29.99, but other vendors sell them for less. 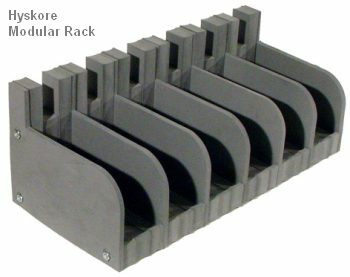 MidwayUSA currently has Versatile racks on sale (through 11/30/2010). Midway’s sale prices are $17.99 for the 4-gun version (item 953075), and $21.49 for the 6-gun rack (item 275638). Click HERE for a 360-degree view of the 4-gun unit. There is also an optional stacking unit, shown below. 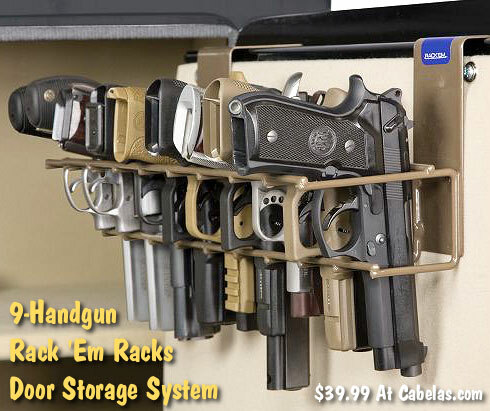 One of the better “on-door” solutions is “The Holster”, a door-top rack from Rack ‘Em Racks. The top bracket secures to the door edge with self-tapping screws. Handguns are held muzzle-down in a plastic-coated wire frame. The installation is quite secure and this system gives you very fast access to your handguns. However, this unit requires that you adjust the top shelf of your safe to fit below your longest-barreled handgun. And, unless you have a very deep safe, you have to clear off most of the items on one side of the top shelf, to avoid interference when you close the safe door. Still, Rack Em’s vertical door rack is a smart design, one that uses space much more efficiently than a door full of separate wire brackets or pegs. Price is $39.99 at Cabelas.com. One other interesting design is the rotary handgun rack. 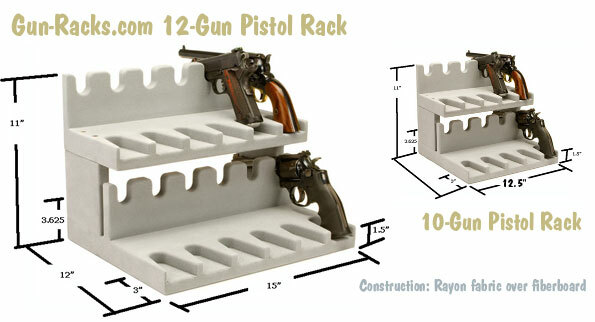 Hyskore offers a 9-Gun Rotary Pistol Rack (item IJ-229069) that looks well-built, and is fairly compact. Like a carousel, it spins to allow easy access to your handguns. It features foam-padded cradles, and an oak-verneer finish. The price is $45.99 at MidwayUSA,. Unfortunately, with a compact 12″-diameter base, there is not enough clearance for scoped revolvers or pistols with red-dot sights. And, from a safety standpoint, we’d rather see the pistols stored muzzle-down than muzzle-up. Still it looks like a clever, compact design that will work with most handguns. An even more efficient use of space is achieved with a two-tier “bunkbed-style” pistol rack. This will hold a large collection of pistols in a relatively compact space. 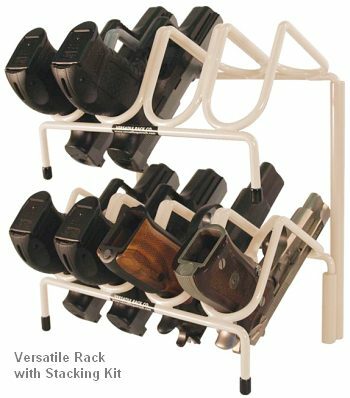 Gun-Racks.com offers two-tier racks with 10-gun ($99.00), 12-gun ($109.00), or 16-gun ($119.00) capacities. These racks are crafted from medium density fiberboard (MDF), then fully upholstered in a soft Rayon fabric that is gentle on your guns. These well-made racks pack a lot of guns in a small space. However, the barrel slots are only 2.5″ apart. So you do get a very compact footprint, but the trade-off is a tight fit on larger handguns.